The Ka-26 (NATO name “Hoodlum”) is a light utility helicopter created by the Kamov design bureau. The Ka-26 first took flight in 1965 and was officially introduced in 1969. The Ka-26 was, more than anything, designed to be an agricultural aircraft. However, the design proved so versatile that this little helicopter found work in a wide variety of industries. It has been used for search and rescue operations, aerial mapping, highway patrolling and even fire fighting. The Ka-26 is a coaxial helicopter as almost all Kamov helicopters are. It therefore has two main rotors and no anti-torque tail rotor. The cockpit is in the form of a bubble shaped cabin, meant to give excellent visibility to the pilot. Another key feature of the Ka-26 is the modular box behind the cockpit, which can be changed out for various mission types. It can also be flown without any box at all. Crucially, the helicopter is small enough to fit onto the load bed of a large truck, making transport relatively easy. This was a piston-powered helicopter that used two 325 horsepower units: the Vedeneyev M-14V-26. The engines were mounted on off board nacelles and were probably the weakest design element of the craft. These engines were maintenance-heavy, but were much more responsive than modern turboshaft engines. Making the Ka-26 great to fly. The main issue with the engine choice is that they essentially leave no power reserve, making the Ka-26 run at 95% of it’s power capacity all the time. Not a great recipe for long-term reliability. Interestingly, while the engines may have been underpowered, the instrumentation is widely seen as overkill. The Ka-26 shared instrumentation similar to its naval brethren of the time. More than needed for a crop duster. Although they Ka-26 did see some limited military use, it’s relatively slow cruising speed made it inappropriate for a military role in general. Another notable issue is that the lower of the two main rotors is so low that the helicopter must be approached with great care. In total 816 Ka-26 units were built. The limitations of the design lead to the Ka-126, which was a single-engine version with better aerodynamics and extended range. Despite this, the original design remains superbly-suited for what it was meant to do: crop dusting. 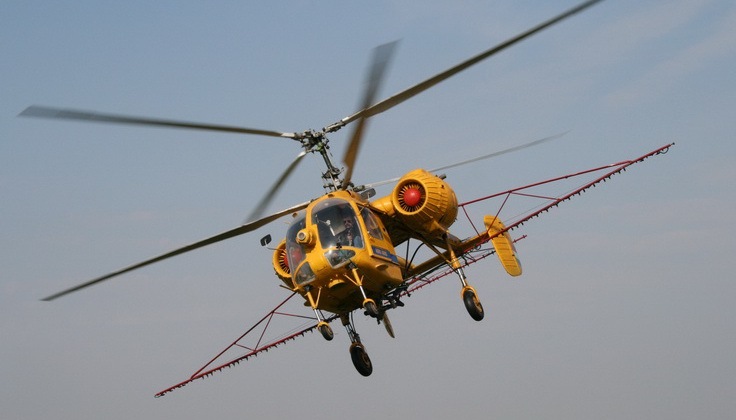 When used for its intended design purpose the Ka-26 is not a “limited” helicopter, but one that does its designated job, while remaining cost effective for agricultural budgets. Production ended in 1985. Do you want to comment the Kamov Ka-26 / Hoodlum helicopter?